The desire for serendipitous urban encounters is a desire for moments, though fleeting, that lead to new discoveries, experiences, or feelings. Such moments may be intensely personal, as in the case of a person meeting a life partner while en route to a particular destination. But there is an element of calculation and foresight as well. You have to work to make that serendipitous moment occur. At least that's what author Nassim Nicolas Taleb tells us in his latest book, The Black Swan. "Work hard," he tells us, "But not in grunt work, but in chasing ... opportunities and maximizing exposure to them. This makes for living in big cities invaluable because you increase the odds of serendipitous encounters." Urban serendipity—if that is truly the term to be used—is a fanciful concept to be sure. But it is also unabashedly romantic. When viewed in this way, serendipity becomes an antidote to the sense of alienation or ennui one may feel while walking in a large city. Imagine some early twentieth century version of Taleb (or Adam Gopnik) encountering a Simmel or Benjamin on the street. And after hearing plaintive or mournful tales of malaise from our resident urban sociologist and mystical Marxist, our Weimar or Second/Third Empire urban booster would probably say something like, "You know what your problem is? You're not meeting enough people! Go out there and be seen." Not so fast. This is all in jest, sure, but it prefaces a worthwhile observation. It's not that serendipity is not possible. We are all, to a certain extent, witnesses to and products of random everyday occurrences. Trouble starts once serendipity becomes an objective or a desirable outcome. And this is because at the very moment that such an objective and desire becomes manifest, serendipity falls by the wayside. Serendipity becomes nugatory, wholly subservient to a kind of environmental conditioning. Now, the term "environmental conditioning" is sure to set off some alarms in those who find concepts such as environmental determinism so anathema. But it points to another observation, one that it as the heart of this post. It is this: architects have been the worst offenders in creating misguided attempts at serendipity. Architects have been known to adhere to a strange belief that serendipity can be guided and induced. Even worse is their idea that serendipity necessitates a kind of formal and/or typological response. This is because serendipity can be rationalized. Blame the program. 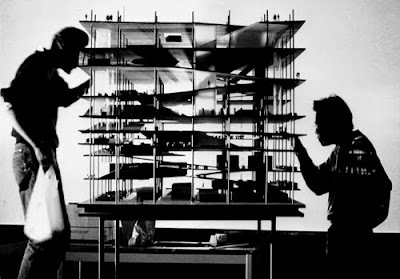 In 1958, architecture historian John Summerson defined "program" as "a description of the spatial dimensions, spatial relationships, and other physical conditions required for the convenient performance of specific functions." And though Summerson's claim that program was a "source of unity" gives the term some kind of historical weight and suggests a plethora of earlier examples, program (along with its equally misaligned sidekicks, event and diagram) took on a new legitimizing function in the 1990s. Like other terms from the era (cf. globalization, flow), program became more of a term of art than anything else, a strategy that sought to (literally) capture the contemporary condition via highly articulated and yet increasingly vague architectural gestures. And in one specific instance, it was a strategy that had an tactical aspect as well. The short-term solution was to elide any difference between the architectural and the urban scale. Serendipity would become the very agent of this elision. No project better encapsulates the aspirations of architectural program vis-à-vis the potential for serendipitous encounters like OMA's 1992 study for two libraries at the Campus Universitaire de Jussieu. Originally designed in the early 1960s by Édouard Albert, the Jussieu Campus was an attempt to accommodate the incoming flux of college-aged, post-World War II baby boomers by creating a new, centralized campus in the Fifth Arrondissement. It was a kind of extreme, neo-Hilberseimerian scheme, an ensemble of rectangular slabs, arranged perpendicularly, forming a gridded network on the banks of the Seine. The project was eventually abandoned and left uncompleted and would not reach any kind of apotheosis until the appearance of OMA's winning entry. The OMA scheme is, in one sense, a completion of Albert's plan. But it also introduced a different kind of architectural gesture, one that sought to introduce to "architecturalize" urban elements. Those familiar with OMA's output will immediately recall the Jussieu project's signature contribution: a program expressed via a single floor plate weaving through the building's various levels and combining the two libraries into a single formal gesture—the humanities library spirals upward from the science library like a meandering ferroconcrete ribbon. Although it certainly anticipates many of the folded surfaces that would be de rigeur during the late 1990s and early 2000s, OMA's library at Jussieu is extremely convincing in its execution. One could very well imagine him or herself entering the library at grade, and slowly making their way up, via the gently sloping, sinewy trajectory, to the upper floors. It is a marvel of sectional complexity rivaling even Yale's Paul Rudolph Hall Art and Architecture Building or Hans Scharoun's Berliner Philharmonie. And when considering the latter alongside the Staatsbibliothek and the Neue Nationalgalerie in Berlin, we begin to notice that the kind of urban ensemble envisioned by Scharoun and Mies must not have been far from Koolhaas' mind. Yet as the maquettes and drawings make very clear, it is a radical break from that precedent. This is because here, the urban ensemble has been consumed by architecture. OMA's library becomes a kind of architectural vortex, sucking and gathering in urban strollers into its coriolis-inflected whirlwind of a plan. To reassert its credibility, we imagine its surface a pliable, a social magic carpet; we fold it to generate density, then from a "stacking" of platforms; minimal enclosure makes it a building—the culmination of the Jussieu network. These surfaces—a vertical, intensified landscape—are then "urbanized": the specific elements of the libraries are reimplanted in the new public realm like buildings in a city ... The visitor becomes a Baudelairean flâneur, inspecting and being seduced by a world of books and information—by the urban scenario. MM: What do you make of this trend toward buildings built not for permanence but just for a short time? RK: I am very bad in trends. I understand almost nothing of the future, only of the present. I always resisted science fiction and found it deadly boring to read. But basically, I think that there will probably be a drastic separation between certain buildings that will become more permanent and others that are not going to be around for more than ten or fifteen or twenty years. RK: Twenty years of involvement in architecture has made me very cynical about that: any program can exist in any building. So if churches are no longer necessary, you can also house offices in churches. RK: Yes, in Europe it happens all the time. They divide churches and create lofts. It also happens in New York. So that is another kind of paradoxical undermining of the argument in architecture that one floor can only support one program. It's complete garbage. The statement seems like a post-hoc rationalization for projects like the Jussieu libraries. The language of mixed programming is right there along with grandiloquent observations about the state of contemporary urbanism. But more than anything, it is a lightly-veiled appraisal of architecture's importance in the global scene. There is the sense that architecture can do anything. Like the architecture that it is supposed to enable, the word "serendipity" has made countless global crossings. The word has been uttered in various ports of call in faraway destinations, been inscribed in notes, letters, and manuscripts. Paintings, engravings, sketches exist, all depicting serendipitous moments. The word has been keyed, punched, and even typed into computers, and emailed into a kind of ætherized dataspace only to arrive in your inbox seconds later. Like the architecture that it is supposed to enable, the word "serendipity" carries unbridled agency. Any moment, as long as it is unplanned, and as long as it yields some kind of pleasurable result, is serendipitous. Yet the word has its own history, and it begins with a fictionalized account of Serendip, the Arabic name for what is now known as Sri Lanka. The word traveled into the West via a tale written in 1557 by the Venetian printer and bookmaker Michele Tramezzino, who based it on Armeno Cristoforo's Peregrinaggio di Tre Giovani, Figliuoli del re di Serendippo. Tramezzino's text was a prose translation of Amir Khursro's Hasht-Bihisht ("Eight Paradises"), composed in 1302. Centuries later, in 1754, the word "serendipity" came into the English language in a letter written by Horace Walpole. Walpole writes, In the letter, he makes reference to the "silly fairy tale" called The Three Princes of Serendip. He relates a specific episode in the story about the Princes' "discoveries, by accidents and sagacity, of things which they were not in quest of." Walpole ends by imploring his reader, "Now do you understand serendipity?" He [Walpole] will probably be for ages remembered as the creator of a new style of domestic architecture …. Great discoveries are sometimes made from small circumstances, and the repair of a little citizen's box at the corner of two high roads revealed to Walpole the great secret of the combined beauty, convenience and grandeur which a revival of our old English architecture was capable of producing. Serendipity, as it turns out, had architectural origins. Yet does not architecture, a discipline that thrives on methodical arrangement of spaces, the careful attention to details, and understanding of the laws of physics, deny the very idea of serendipity? How can something that exerts as much requisite energy, planning and foresight as the design and construction of a building exemplify what Walpole would call "accidental sagacity"? More than a symbolic activity or form, planning has meaning unto itself ... [P]lanning is seen as an irreducible activity, something akin to what Huizinga called play. Huizinga stripped play of the cultural layers that obfuscated what he considered its "primordial quality," something essential lying "in a deep layer of our mental being." He saw play as an "inferior" reality, a "stepping out of 'real' life into a temporary sphere of activity with a disposition all of its own." Below the layers of metaphor and quite separate from the practical considerations of technique, planning is an activity people engage for its own sake, because it brings a form of pleasure. Planning fills the anxious void between present and future, the wonder of time's slow melt, with joy. For instance, in as much as utopia has been seen as a critique of the present, it is not a form of play-planning, as well, lending a raw humor to the precariousness of human consciousness: knowing that there is a future and not knowing its nature. Planning, like play, institutes an order. The space and time of play and the rules of conduct—what Huizinga called the playground—are marked off ahead of time. Equally important is Shanken's own observation about play as a kind of subterfuge with spatial ramifications. In his study of play and its relation to suburban sprawl (a study which looks to, of all things, the hit MTV show Jackass), Shanken observes how the term "inner suburb" calls attention to "a cultural geography of abandonment and savage play" that intends to "convey an activity in which social boundaries are tested and set." Here too Huizinga becomes the point of reference. "Huizinga argued for an understanding of play as an amoral social function through which people negotiate ever-changing limits of behavior and culture." Here, then, are indications that play is kind of very highly-organized activity. Play is as calculating as it is reactive. It is a term that suggests an oppositie to serendipity. Play is not accidental. Play is structured, orchestrated, and rehearsed. It is anything but improvisatory. By the time we get to Tokyo, the rules have changed. The game is still going on, many of the pieces seem familiar, but new configurations take place. What is seen and what is spoken get rearranged, and as the invisible becomes tangible, the word takes on flesh. Hartley lets us in on this by staging a prologue of sorts, in which we see not only gestures but the director's hand as well the process of rehearsal and preparation within the world of professional performers. They players are introduced from the start as part of a grand design as we see them positioned and instructed. The incidents in Tokyo become more public, glimpsed by panicked passersby, even investigated by the police. This is a story with little privacy and with a constant awareness of being witnessed, through a doorway or around a corner. Echoing Walter Ruttmann's idea of a city symphony, here, the medium of film transforms urban serendipity into a kind of scripted, structured event. But more than anything else, serendipity presupposes a kind of self-consciousness. Stay with Flirt towards the end and watch carefully. Yes, that's Hal Hartley starring in his own film. Yes, those are film cans. And yes, in those cans are footage taken in New York and Berlin. 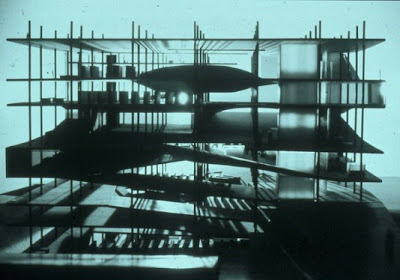 John Summerson, "The Case for a Modern Theory of Architecture," reprinted in Joan Ockman, ed. Architecture Culture: 1943-1968, A Documentary Anthology (New York: Rizzoli, 1996), p. 223. Rem Koolhaas and Bruce Mau, S,M,L,XL (New York: Monacelli Press, 1995), pp. 1310-1312, 1316-1317, 1323-1325. J.W. Croker, The Quarterly Review (1843), pp. 516-522, quoted in Robert King Merton and Elinor G. Barber, The Travels and Adventures of Serendipity: A Study in Sociological Semantics and the Sociology of Science (Princeton, New Jersey: Princeton University Press, 2004), p. 32. Andrew Shanken, "From Total War to Total Living: American Architecture and the Culture of Planning, 1939-194x", Unpublished Ph.D Dissertation, Princeton University (1999), p. 29. Shanken, "The Sublime 'Jackass': Transgression and Play in the Inner Suburbs," Places Vol. 19, No. 3 (2007), p. 54. Tom Gunning, "Thrice Upon a Time: Flirting With a Film by Hal Hartley" in Hal Hartley, Flirt (Screenplay) (London: Faber and Faber, 1996), p. ix. a good one, enrique! resonant for me, since my masters work focused on an urban redevelopment proposal i dubbed 'developing a field of encounter'. never used the word serendipity, but i was certainly intending to frame a sort of catalytic condition for future urban/street activity: strategically located public projects that would create a 'charged' zone for private infill between them. It'd be so great if all architecture blogs could produce posts of this quality. This is seriously well done. Breat post, I find this quite interesting, times change- so should architecture and design. Thank you for such wonderful insights. I particularly appreciated the etymology of "serendipity," though I had never before considered that word in architectural terms. Really interesting stuff.